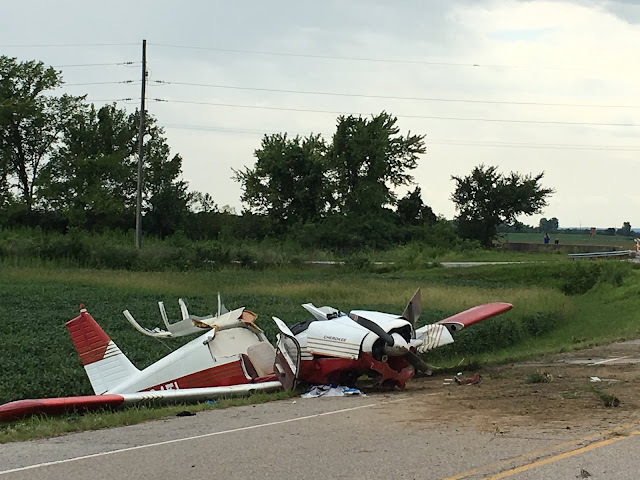 On July 28, 2018, about 1225 central daylight time, a Piper PA-28 airplane, N624FL, collided with terrain near Columbia, Illinois. The flight instructor, student pilot, and 2 passengers were are seriously injured and the airplane was substantially damaged. The airplane was registered to and operated by a private individual under the provision of Title 14 Code of Federal Regulations Part 91 as an instructional flight. Visual meteorological conditions prevailed for the flight, which operated without a flight a flight plan. The flight was originating at the time of the accident. According to information provided by the pilots, on takeoff from Sackman Field Airport (H49), Columbia, Illinois, the airplane did not gain altitude. The airplane continued forward about a mile from the runway where they came upon a transmission line. The pilots tried to avoid the transmission line, but the airplane contacted the line, descended, and impacted terrain. (12:30 p.m.) A small plane has crashed near Red Roof Gas Station on the north end of Columbia. Four people, including one child, have been transported to area hospitals. The initial report is the plane was either trying to lane or take off from nearby Sackman Airfield when it clipped a power line. The pilot then brought the plane down alongside Palmer Road / Bluff Road near the Rt. 3 overpass. Columbia paramedics, firefighters and police officers rushed to the scene. Firefighters used Jaws of Life to remove the plane’s roof to extricate one of the persons trapped inside. 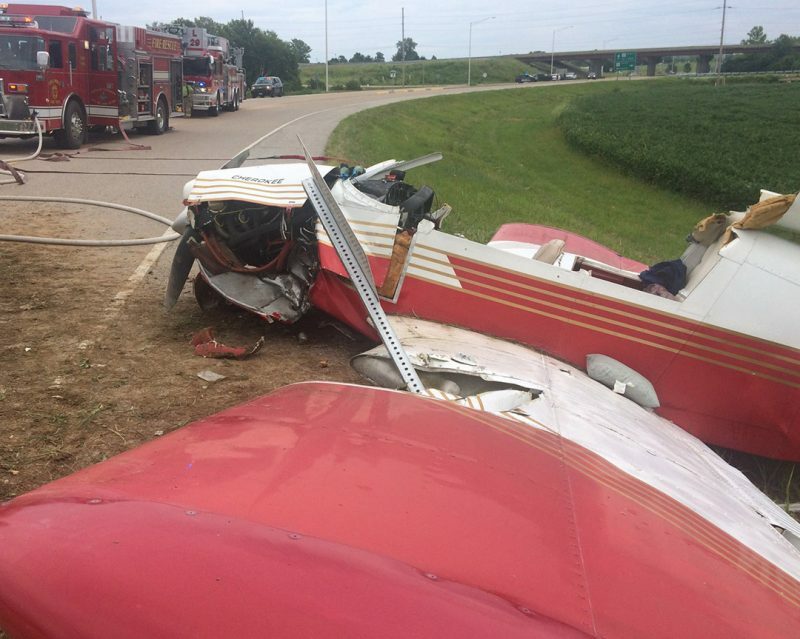 The pilot and three passengers were transported by ambulances to hospitals - two to St. Louis University Hospital, one to St. Anthony's Medical Center, and a child take to Children's Hospital. Their injuries were not considered life threatening. The FAA is heading to the scene to handle the investigation. Palmer Road from Rt. 3 to Sandbank Road / Bluff Road will remain closed for several hours today. Power was knocked out on the north end of Columbia after the plane hit the electric line. Ameren / IP crews are working to restore power, including at the Rt. 3 / North main stoplight. 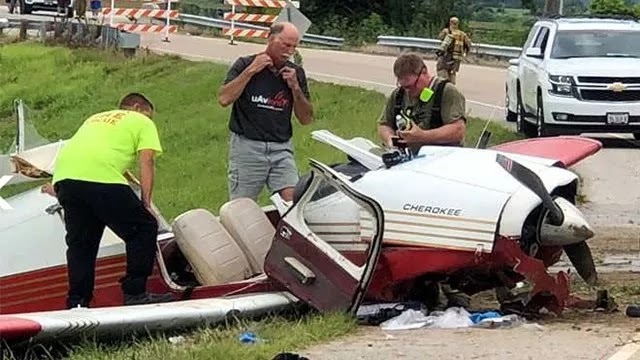 The Federal Aviation Administration website lists the plane as a Piper PA-28-140 Cherokee owned by a rural Fults resident. COLUMBIA, Ill. • A small plane crash-landed at about 12:30 p.m. Saturday after taking off from Sackman Field, a small private airport in Monroe County, near the intersection of Route 3 and Interstate 255. A witness reported the single-engine plane was flying low to the ground when it clipped a power line and crashed in a field near Bluff Road, Capt. Jason Donjon of the Columbia Police Department said. Four passengers — two men, one woman and a boy — were aboard the aircraft when it crashed. The child was taken to St. Louis Children’s Hospital. Two of the adults were taken to SSM Health St. Louis University Hospital, and one was taken to St. Anthony’s Medical Center. All had injuries that weren’t life-threatening, Donjon said. The pilot and passengers were not identified by police. The Piper PA-28-140 Cherokee is registered to Scott Schweitzer, of Fults in Monroe County. Donjon said the Federal Aviation Administration and the National Transportation Safety Board would take over the investigation. An employee of the Red Roof Liquor and Lottery store, at 301 Southport Drive, told the Post-Dispatch he was checking out customers when the power went out in the store. He went outside to investigate, and saw the downed plane. The outage initially affected about 1,300 customers, Tucker Kennedy, a spokesman for Ameren Illinois, said. Power was restored to almost all customers by 2:14 p.m., he said. 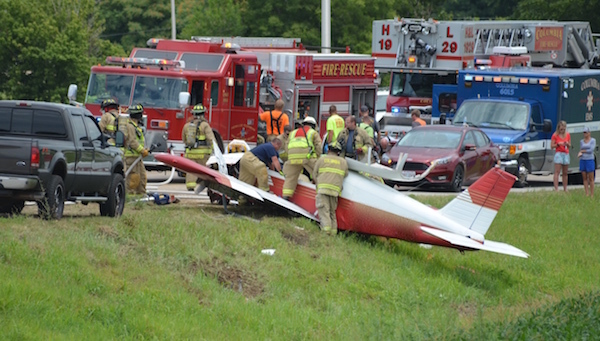 Several emergency agencies responded about 12:30 p.m. Saturday to a plane crash at Palmer Road near Red Roof Liquor & Lottery on Southport Drive in Columbia. Columbia police, fire department and EMS personnel responded to the scene along with the Monroe County Sheriff’s Department, Monroe County EMS and Dupo Police Department. 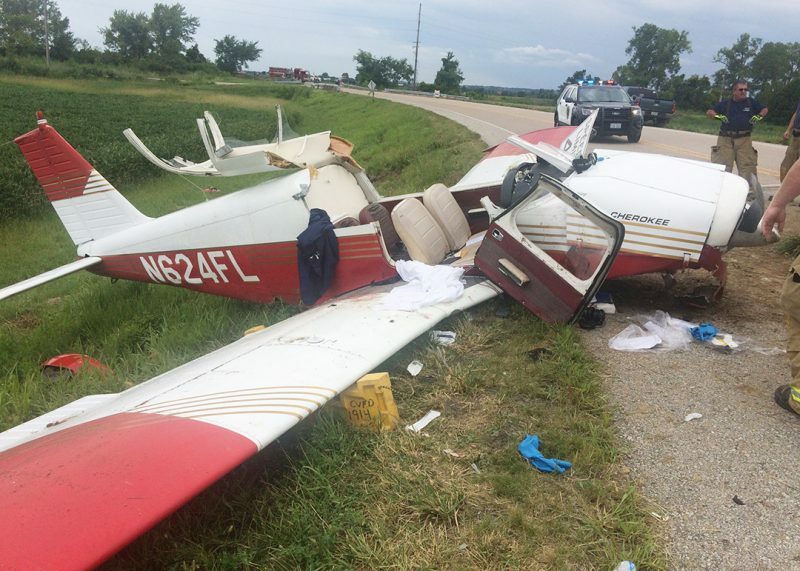 Police said all four occupants on board the Piper PA-28-140 Cherokee were transported to St. Louis hospitals. One of the occupants was a young boy, who was transported to St. Louis Children’s Hospital for injuries not considered life-threatening. Two adults were transported to Saint Louis University Hospital, and another adult was transported to St. Anthony’s Medical Center in St. Louis County. Two of those on board the plane were local residents and two were from St. Louis, police said. The plane had just taken off from nearby Sackman Field off Bluff Road, police said, and witnesses observed it flying very low shortly before the crash. The plane clipped power lines, knocking out power near the crash scene. The stoplights at the busy intersection of Route 3 at North Main Street were not functioning and caused a traffic back-up. Power was restored to most of those affected within a couple of hours, but some residents in the bottoms remained without power late Saturday afternoon. The Federal Aviation Administration and National Transportation Safety Board have been contacted to respond to the scene. Palmer Road was expected to be closed from Southport Drive to DD Road at Bluff Road into the evening hours as FAA and NTSB officials investigate the crash. 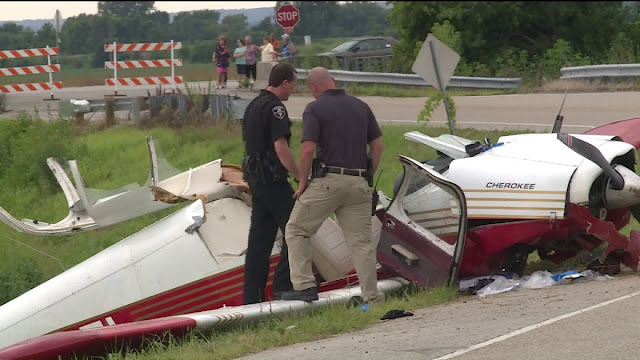 A pilot and three passengers were injured when a small, single-engine plane crashed Saturday afternoon in Monroe County. 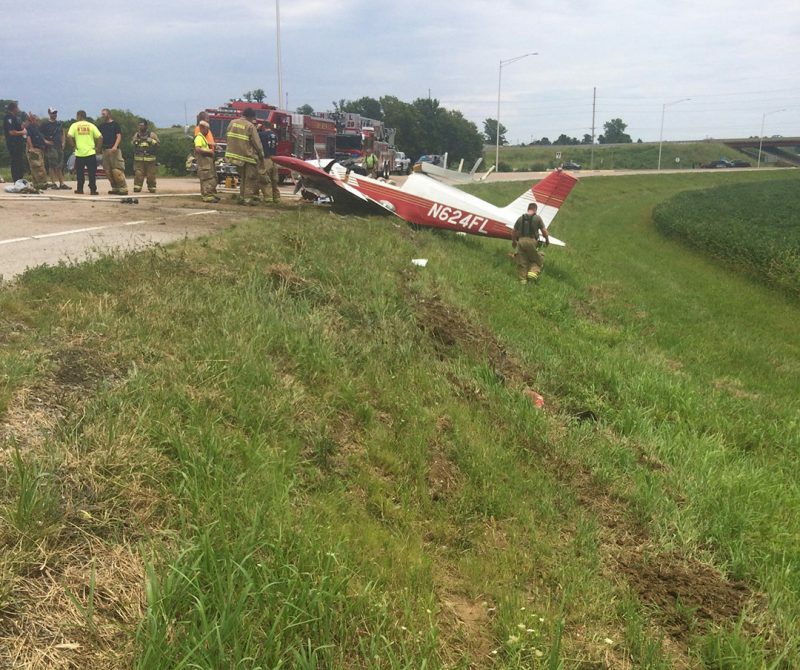 The Piper PA-28-140 Cherokee crashed near the Red Roof gas station, near Illinois 3 and Interstate 255 in Columbia. Authorities said the pilot and three passengers were taken to hospitals for treatment of injuries that were not considered life-threatening. The names of the occupants were not immediately released. Columbia Assistant Police Chief Jason Donjon said they were two adult males, an adult female and a boy. Donjon said witnesses reported that the plane seemed to be flying low. Firefighters cut off the top of the plane’s cockpit to get to the occupants. The pilot apparently was trying to land or take off from the nearby Sackman Field airport when it hit a power line, authorities said. The crash happened about 12:30 p.m. Power was out for a portion of Columbia following the crash. 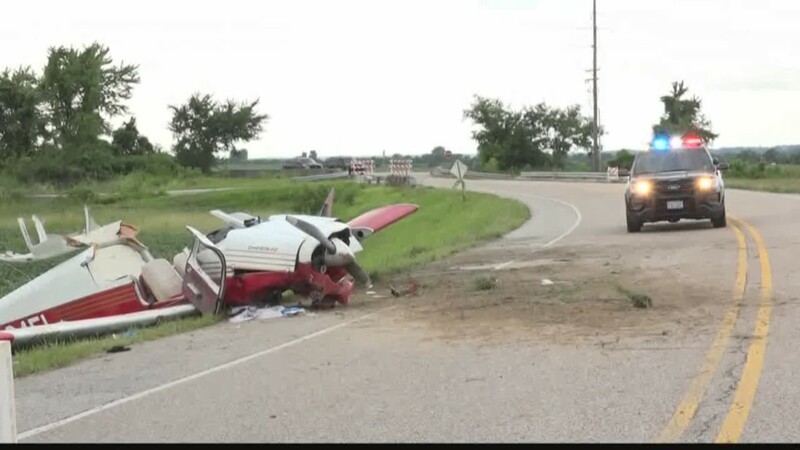 COLUMBIA, IL - Three adults and a child survived a plane crash near Columbia, Illinois Saturday. They were all taken to the hospital. The plane was a Piper Cherokee. It appeared to be upright when crews were on scene but the roof had been torn off. Police say the crash happened around 12:30pm near Palmer Road and Southport Drive. The crash knocked out power to the surrounding area and also caused a street light on Route 3 to stop working, backing up traffic. 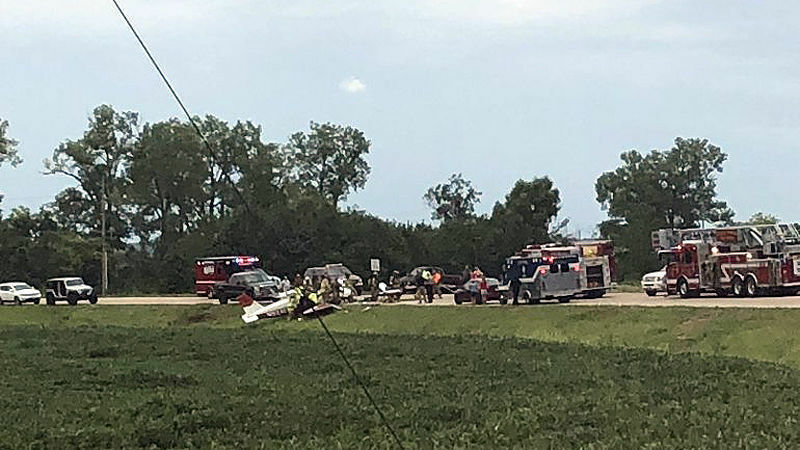 The crash has been reported to the Federal Aviation Administration and the National Transportation Safety Board as an investigation into the cause continues. There has been no word on the condition of the people on board, but we do know that the child was taken to St. Louis Children's Hospital. In the first photo it looks like the street sign barely missed hitting the left fuel tank. 4 people, even if 1 woman, 1 child, is a substantial load for a 140 Cherokee.